Is it Cyrano de Bergerac or a scene from Private Lives? 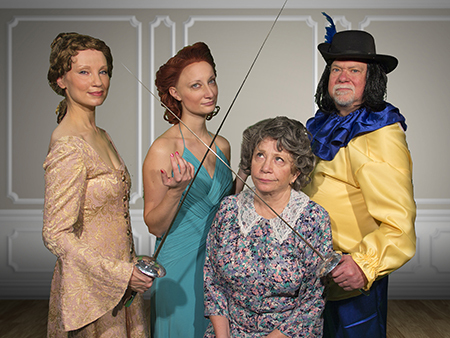 From left are Maureen Hackett as Charlotte Hay, Angela Fasanella as Rosalind, Linda Cunningham as Ethel, and John Pinto as George Hay. Photo by John Maurer. It's unrequited love for poor Richard (Matthew Cassidy), the troupe's lawyer, ever pining for Charlotte (Maureen Hackett). Photo by John Maurer. 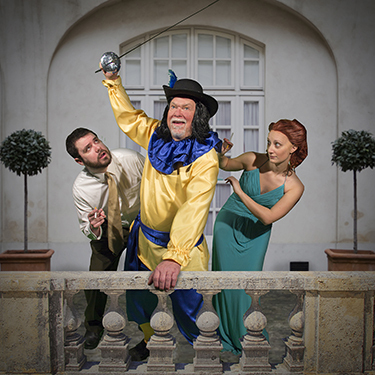 Cyrano, center (John Pinto), is in the wrong play yet again! -- with Tim Moran as Paul and Angela Fasanella as Rosalind, who are appearing in Private Lives. Photo by John Maurer. West Windsor, N.J. – A theater couple with a last chance at stardom sets the stage for hilarious farce at Mercer County Community College’s (MCCC’s) Kelsey Theatre. Ken Ludwig’s "Moon Over Buffalo" will be presented by M&M Stage Productions Fridays, Feb. 23 and March 2 at 8 p.m.; Saturdays, Feb. 24 & March 3 at 8 p.m.; and Sundays, Feb. 25 and March 4 at 2 p.m.
Kelsey Theatre is located on the college’s West Windsor Campus, 1200 Old Trenton Road. A reception with the cast and crew follows the opening night performance on Feb. 23. M. Kitty Getlik, the artistic director at Kelsey Theatre, is taking a turn as the show's director and is having a wonderful time. "It's a play-within-a play, actually a play-within-two-plays, making for some very frantic and funny scenes. I am so fortunate to be working with such a talented cast. Rehearsals have been fast-paced and hilarious," she said. Veteran stage actors George and Charlotte Hay are perilously close to the final act of their uninspired careers. Appearing at a repertory theater in Buffalo, New York, their small acting troupe is performing two stage classics in rotation: the Noel Coward comedy "Private Lives” and Edmond Rostand’s drama, "Cyrano de Bergerac.” In the midst of a marital spat, the couple gets word that a famous Hollywood director is coming to town in hopes of casting them as the replacement stars for his current film. All they need is one perfect performance – which may be just too much to ask of this troupe in disarray on every possible level! "Moon Over Buffalo" opened on Broadway in 1995 and ran for 309 performances. The M&M cast includes John C. Pinto of Yardley, Pa., as George Hay; Maureen Hackett of Robbinsville as Charlotte Hay; Angela Fasanella of Hamilton as Rosalind (Roz) Hay; Christopher Schmalbach of Palymra as Howard; Tim Moran of East Windsor as Paul; Linda Cunningham of Yardley, Pa., as Ethel; Matthew Cassidy of Morrisville, Pa., as Richard; and Jennifer Litzinger of West Windsor as Eileen. In addition to Director Kitty Getlik, the production team includes Producers Mike Almstedt and Mike DiIorio, Assistant Director Elio E Lleo, and Stage Manager Melissa Gaynor. Tickets are $18 for adults, $16 for seniors, and $14 for students and children. Tickets may be purchased online by calling the Kelsey Box Office at 609-570-3333 or. Kelsey Theatre is wheelchair accessible, with free parking next to the theater. For a complete listing of adult and children's events, visit the Kelsey website or call the box office for a brochure.